Sometimes you make a dish so simple and unpromising, you’re wondering why you even attempted it. Then you taste it and you hate yourself for ever doubting its capabilities. 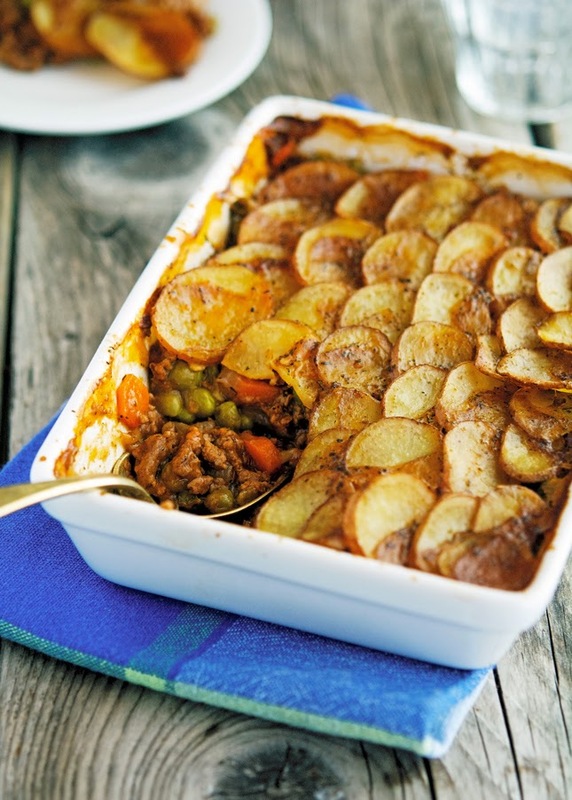 This Cottage pie is one of those dishes. 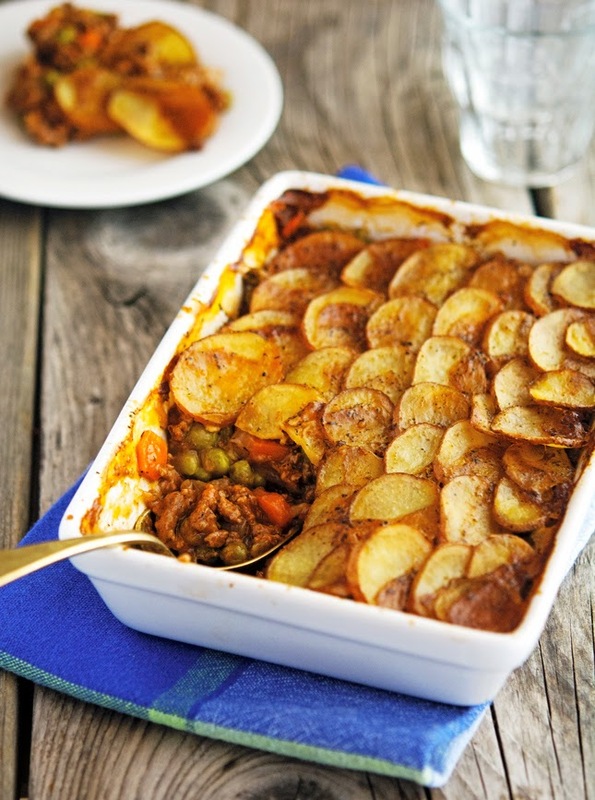 A few basic ingredients: ground beef mixed with vegetables, topped with sliced potatoes. Simple. Then you put it in the oven for about 40 minutes, and what comes out of it is a dish that just sings. A perfect balance of flavours, tasty, everything is perfect. Just like a good song. A song that hits your nerve and you’re like ‘Oh my god, I love this song’. You know, one of those songs you keep playing on your iPod, over and over, and never get tired of it. Like ‘Step’ by Vampire Weekend. One of the best songs ever imo. When you wrap together some of the most clever lyrics ever written (“Wisdom's a gift, but you'd trade it for youth, age is an honor - it's still not the truth”) with a great tune, you’ve got yourself a perfect song. And just like a perfect song, this Cottage pie is a perfect blend and balance of flavors. A Cottage pie is basically a Shepherd pie, with one big difference. Shepherds pie is made with fresh ground lamb, (lamb -> shepherd), or minced leftover lamb from Sunday roast (which begs the question: who has leftover of lamb?) If you use ground beef instead, the dish is called Cottage pie. A traditional Cottage pie is topped with mashed potatoes. I used potato slices instead, because it saves a lot of time and looks really awesome. Basically what you have here is tasty mixture of vegetables and beef topped with "potato chips". I’m sure you’re going to love this Cottage pie; it’s a classic one-dish meal, easy to make and deeply comforting. Trust. Cottage Pie Print this recipe! Note. Real cottage pie is made with dark (porter) beer, not beef stock. However, I’m not a big fan of the bitter aftertaste, so I prefer to use stock. Feel free to use beer for a more authentic flavor though. Melt one tablespoon of butter in a large skillet over medium-high heat. Add onions and carrots, and saute’ - stirring every so often - until onion is soft, about 5 to 6 minutes. Season with salt and pepper, and stir in tomato paste. Add ground beef and cook, breaking up with a wooden spoon, until browned, about 4 minutes. Add thyme and beef stock and bring to a boil. Cook, stirring constantly, until it starts to reduce, about 3 minutes. In a bowl mix arrowroot powder (or cornstarch) with ½ cup of cold water. Add to beef mixture and cook until it thickens, about 2 minutes. Stir in peas and adjust seasoning, if needed. Transfer mixture to a 2-quart baking dish. Top with potatoes, overlapping slices. Melt the remaining tablespoon of butter and drizzle over the potatoes. Bake until the potatoes are browned around the edges, about 40 to 45 minutes. One serving yields 235 calories, 9 grams of fat, 11 grams of carbs, and 22 grams of protein. Yum! Perfect for cold winter nights, plus I have an easier time finding beef than lamb out here. Now I have a huge conundrum - I was gonna make David's bourbon spiked chili for friends coming over this weekend - but after seeing this gorgeous pie - I am stumped! ...I wonder what it's called when turkey is used instead of ground beef or lamb? hmm? Yeah, I say make 'em both that's the only solution! Loving the sliced potatoes! A great topping, for sure. Happy Friday! You just gave me a great idea for a post I'm planning. This one looks yum Mike. How awesome would it be for our superbowl Sunday?...Thanks for sharing. I never knew there was a difference between cottage pie and shepherds pie- geeze you teach me something new each time! I love making it with sliced potatoes too because it looks so fancy- Unlike the main lyric in Iggy Azalea's song. I can't stand that song, soooo annoying! Very interesting about the difference between shepherd's pie and cottage pie. It makes perfect sense, but I'll bet very few people (especially in the US) realize that. As one who loves a good beer (including those wonderfully bitter IPAs) I would probably try this with beer, at least once. You should totally try it with beer then, I'm sure you're going to love this! Shepard or cottage pie has been on my list to cook for a long time. Hopefully your recipe will motivate me to do so. Thank you! I'm so glad you like the song Sally, it's one of my fave from Vampire Weekend. I love everything about it! Haha I didn't know the difference either!! and I've lived in London for 6 years. Oops!! 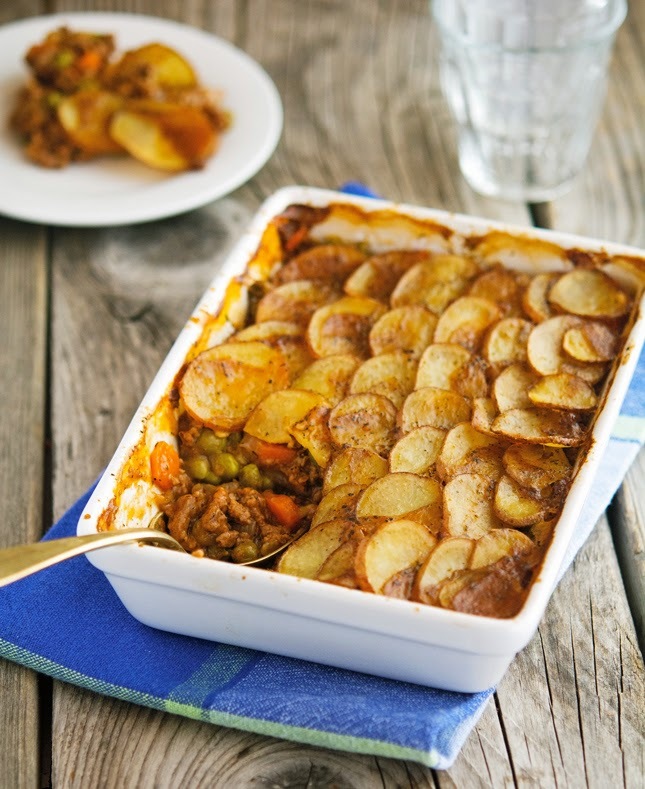 Looks delicious, makes me want to have a cottage pie right now! You lived in London 6 years??? Lucky you, it must have been an amazing experience! 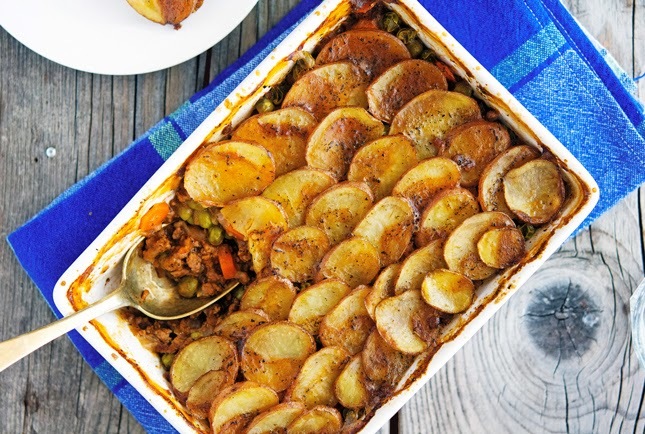 I love how you topped this cottage pie with roasted potato slices rather than mashed potato. I've eaten a lot of cottage pies in my time and definitely need to try out your recipe! Hi Mike, beautiful pie, love how you made your own stamp on this! I'm with you man, beer is for drinking, stock is for cooking! Humble food is the best, most comforting kind of thing to eat in the winter! I really love the potato slices instead of mashed potatoes, less work is always good and the presentation is an extra benefit! I am a fan of pie and I do love cooking and baking. This is why I spend time searching for different recipes and your blog site is one of my favorite place to read and learn. Can I just suggest a thing? can you write a recipe for some Chinese foods? Maybe a good read about hong kong peking duck. =) yay! Will be very happy for that.Anyway, be back to this cottage pie, I wonder if its okay not to add carrots? The flavor of this dish was absolutely fantastic but mine ended up absolutely SWIMMING in oil and grease and my potatoes didn't crisp. I didn't change anything from the recipe. I'm not sure what happened. Any tips on how to achieve the same results you did? Drain off the drippings from the ground beef and veggies before added the beef stock and thyme. It might also depend on how lean the meat is you are using. a 80/20 mix will have much more fat run off than a 96/4. Really excited for this one. I really like making mashed potatoes, but dislike all the water and nutrients going down the sink drain. :( This is a great idea, I can't wait to try it this week! I will make this one for sure but will substitute with sweet potato topping! Tried this the other night came out of the oven perfect! Definitely will make again and again. Comfort food at it's best. I made this exactly by the recipe - it was delicious but my potatoes unfortunately didn't crisp up like your pictures - they cooked through but stayed kind of soggy and didn't become golden. I think maybe there was too much butter on them, or they were cut too thin? I may try broiling for a while toward the end next time. The meat part was perfect though! Thanks for sharing this recipe. I made it for dinner last night and am eating the leftovers as I type this. The cottage pie was easy to prepare. It even reheats well. I'll definitely make this dish again.